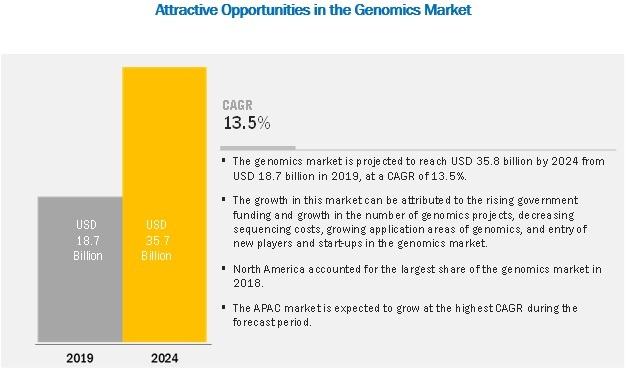 [218 Pages Report] The global genomics market is projected to reach USD 35.7 billion by 2024 from USD 18.9 billion in 2019, at a CAGR of 13.5% during the forecast period. Factors such as the rising government funding and growth in the number of genomics projects, decreasing sequencing costs, growing application areas of genomics, and the entry of new players and start-ups in the genomics field are driving the growth of the genomics market. However, the high cost of genomic equipment could limit market growth to a certain extent in the coming years. On the basis of product & service, the genomics market is segmented into consumables, systems & software, and services. In 2018, the consumables segment accounted for the largest share of the genomics market; whereas, the services segment is expected to register the highest growth during the forecast period. The high growth of the services segment is attributed to the rising number of genomic services start-ups. On the basis of technology, the genomics market is segmented into sequencing, microarray, PCR, nucleic acid extraction and purification, and other technologies (such as branched DNA analysis, single-cell genomic analysis, and flow cytometry). The PCR segment accounted for the largest share of the genomics market in 2018. Technological advancements, increasing research in the field of genomics, and the lower cost of DNA amplification using PCR are the key factors driving the growth of this market. On the basis of application, the genomics market is segmented into diagnostics, drug discovery and development, personalized medicine, agriculture and animal research, and other applications (such as forensics and biofuel research). Diagnostics is the largest and the fastest-growing application segment in the genomics market. Growth in this segment can be attributed to the increasing research on diseases such as cancer and genetic disorders and the decreasing cost of sequencing. On the basis of end user, the genomics market is segmented into research centers and academic & government institutes, hospitals and clinics, pharmaceutical and biotechnology companies, and other end users. The research centers and academic & government institutes segment accounted for the largest share of the genomics market in 2018. The large share of this segment can be attributed to the increase in research intensity in this end-user segment and the rising funding for research. Thermo Fisher Scientific, Inc. (US), Illumina, Inc. (US), QIAGEN N.V. (Netherlands), Agilent Technologies, Inc. (US), Eurofins Scientific (Germany), BGI (China), GE Healthcare (US), Bio-Rad Laboratories, Inc. (US), F. Hoffmann-La Roche Ltd. (Switzerland), and Oxford Nanopore Technologies (UK) are the key players operating in the genomics market. Where will all the market developments take the industry in the mid-to-long term? What are the upcoming products and technologies in the genomics market? Which application segments will dominate the genomics market in the future? Emerging countries have immense opportunities for the growth and adoption of genomics solutions. Will this scenario continue in the next five years? Where will all the advancements in the genomics market (offered by various companies) take the industry in the mid-to-long term? *Business Overview, Products Offered, Service Offered, Recent Developments, MnM View Might Not Be Captured in Case of Unlisted Companies. The study involved four major activities to estimate the current size of the genomics market. Exhaustive secondary research was done to collect information on the market and its different subsegments. The next step was to validate these findings, assumptions, and sizing with industry experts across the value chain through primary research. Both top-down and bottom-up approaches were employed to estimate the complete market size. Thereafter, market breakdown and data triangulation procedures were used to estimate the market size of segments and subsegments. In the secondary research process, various secondary sources such as D&B Hoovers, Bloomberg Business, and Factiva have been referred to so as to identify and collect information for this study. These secondary sources included annual reports, press releases & investor presentations of companies, white papers, certified publications, articles by recognized authors, gold-standard & silver-standard websites, regulatory bodies, and databases. After arriving at the overall market size—using the market size estimation processes as explained above—the market was split into several segments and subsegments. In order to complete the overall market engineering process and arrive at the exact statistics of each market segment and subsegment, data triangulation and market breakdown procedures were employed, wherever applicable. The data was triangulated by studying various factors and trends from both the demand and supply sides in the genomics industry. This research report categorizes the genomics market based on product & service, application, end user, and region.